Continuing symptoms: Sore feet, frequent bathroom visits, heartburn, sore hips. New symptoms this week: I have started to notice braxton hicks again. Cravings: Sugary things of course. I so badly want 2 dollars worth of 5 cent candy! Movement: My little bro felt the baby move the other day! He was so pumped! Baby sure loves to squirm around a lot. I have started to feel feet or something pressing on my ribs sometimes. Eric still doesn't get to feel baby a lot, seems to just like to move for mommy still. Tomorrow I go for my 2hr glucose test. I am hoping I will pass. I have been taking my blood sugar myself and it has been normal if I eat decently. So even if I do fail, I know I will be able to control it with diet alone, which is awesome! I have been thinking a lot about labor and delivery lately. I really want a natural, unmedicated birth. I am worried about being pressured into something at the hospital. I want to be able to move around, eat and drink and give birth in whatever position I feel is right. I can totally understand why people have home births now. I would LOVE to have a midwife, but they are few and far between in MB. Here is my 28 week and 32 week pictures. I think I look exactly the same. I was expecting to look way different! I think your belly looks a little lower in the second pic, but it could be angle? Anyway, don't stress too much about the birth. I still haven't really had my ideal birth. Though I would say that I will never take any drugs other than the gas mask again. Emery's birth was completely natural, no gas or anything, and it was hard, but it was good! I have always been stuck in the bed though. My labours go too fast, so they are still monitoring me when it's time to push. At that point, I can't move. Too painful! I know many women who have had natural, unmedicated births in hospitals (most at St. B). So if that is what you want, I would suggest you and Eric make a good plan so that he can support you and not let you get talked into things (husbands can be the best advocates!). It sure can be done! I know hospitals can get a bad reputaion for pushing drugs, etc. but after G I am a big fan of them. No, I didn't get the birth I wanted but if I had been at home or at the birthing center, or even at Selkirk things would have ended pretty badly. Having all things available is a huge blessing when/if needed. If we are blessed with a second baby it will be delived at St. B., hopefully naturally with no medication... but I know there are no gaurantees! Glad to hear that everything is going good! I had a all natural birth! I gave birth in Selkirk and they didn't pressure me into anything! Honestly, looking back it hurt like hell, but I would do it again in a heart beat! God designed us to give birth!Praying for you and Eric as it comes closer to the due date! :) You will do amazing! Key it to remain calm, and YOU be in control! You are SOO cute!! 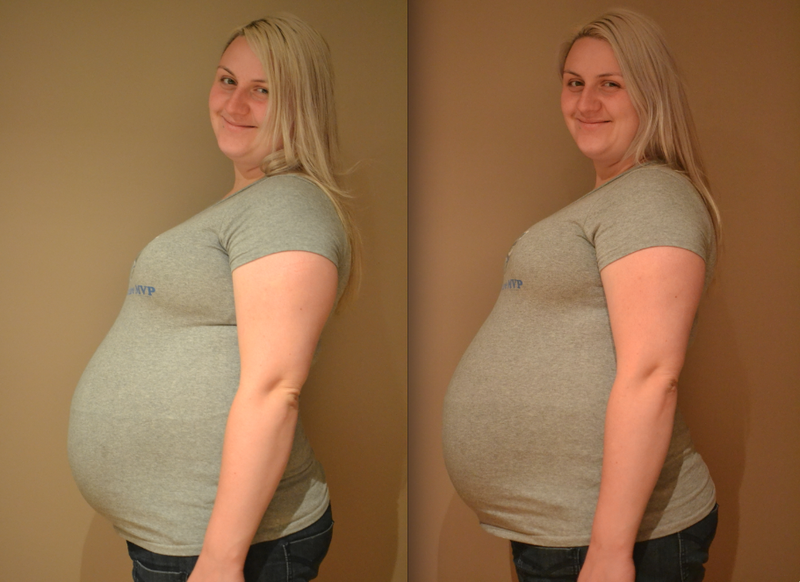 And yep, you look similar to your 28 week pic:) So exciting to feel the baby move! Bet you can hardly wait to meet him/her..
And kudos to you for doing things your way for your labor. You absolutely should do what your heart desires - it's your special day! Yea...you definitely look like you've dropped...good sign!